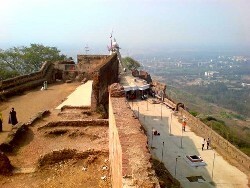 The fort name is Parnera. It is in Atul/Gujarath(160 km from Borivali). Atul is a small industrial place. We was seven in the group. We traveled by Virangam passenger from Borivali st. at 11:35pm. In the train when we was sharing our trekking & mountaineering experience we was very enthusiast of hearing each other. Nobody had been to this place out of seven. So we was mentally prepared for the worst. We reached to Valsad at 3:45am. then went to Valsad Bus depo & took little rest. Though we need to get down at Atul we could not do so since this train doesn't have stop at this place. If by luck it halts at Atul then that was possible. At 6:30 a we went by bus to Parnera village. You won't find any hotels here. So for tea & all you need to take at depo only else you need to walk 21/2 kms from Parnera. So initially we thought of a tiresome trek, but no it was not a trek for me it was simply walking on the steps & reach to the top in the man made jungle of Saag Tree. As we reach there heavy rain started. We took shelter in the Mandir for 20 min. then started to browse through the Fort. We found it was a lone hill in this area. Except this there was no such heighten area where who ever have build this fort could have found commanding place for fort. The place on the top was so less for fort. But such fort in marathi called Gadhi. The fort has well planned structure. We found three canon(Tofh) with different bore diameter kept a side of the fort . As usual their is construction going on for a Masjid & Temple. Though their are already two old temple exist. This fort has got few water tanks also. The fort is constructed by bricks which might be according to us is an indication of recent construction. After browsing the fort we took little rest on the wall of the fort viewing scenery of the valley down with variety of birds. This is a good trek for bird watcher. We saw Peacock, Landore, Barbet, Bharadwaj. After spending one hr. there we started back to search the peacock closely since they was lot in numbers. So took some different root from where all peacock was shouting to their mate. It was so beautiful scene when we saw a group closely. Also we saw take off of one peacock with his long tell. In the morning sun & natural green wallpaper as a background, those peacock color's was so beautiful we thought our trek is successful without physical exertion. It was a highest point when we saw a peacock opening his colourful tail in the circular fashion and dancing in the morning sun. It was like he is doing a record dance for us free of charge. The way he was shaking his pisara & taking round in the open area made us to watch him completely till he stopped doing so. It was a call for his loving mate. Then all we came back to home the same way like Valsad-Mumbai in the afternoon. We had a faught with local TC in Valsad so get down at Vaphi for clearance. We compromised the problem for Rs. 100/- though we had a proper ticket according to us. I was at home in the afternoon at 3:30pm.